Today’s lovely, lacy invitation crush comes to us from Margaux Fraise of Harmony Creative Studio, whose concept for her own wedding invites, a modern take on a vintage lace design, was translated beautifully by Shayna from Steel Petal Press, who designed and printed the gorgeous gray and peach letterpress wedding invites. 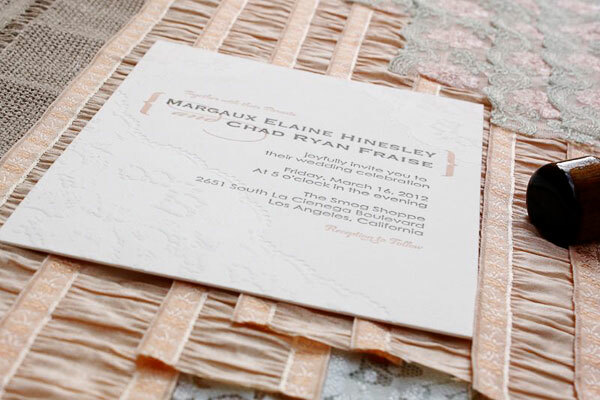 Details like the textural, blind debossed lace designs, vintage postage stamps, unexpected vertical envelope orientation, and playful vintage Los Angeles save the date turned RSVP card make this beautiful suite a true standout. When I started designing my own wedding, I had a very clear vision: ‘Modern Vintage’. 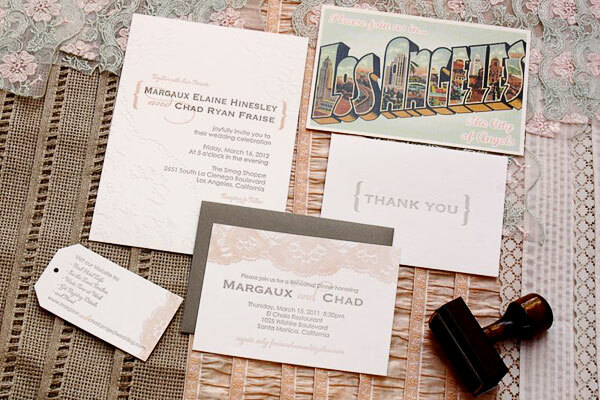 I had dreams of lace, kraft paper, and vintage elements with a modern twist. We held our wedding at the electric Smog Shoppe here in our hometown of Los Angeles, but the bulk of our guests are my husband’s large family from Iowa. I wanted to incorporate a vintage Los Angeles postcard with the invitation suite and decided to take what is normally a cute save the date and turn it into the RSVP card. 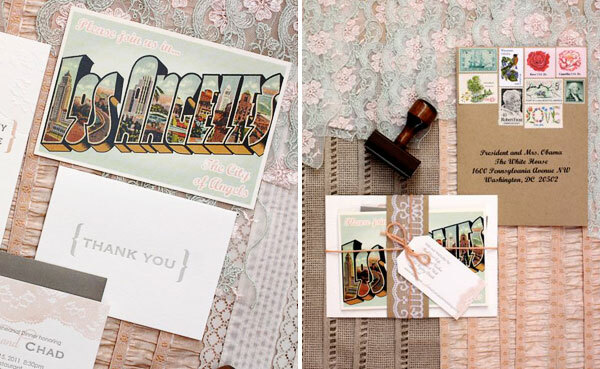 Ginger from Serendipity Beyond Design was able to customize the original colors (blue and orange) in the Los Angeles postcard to our soft color palette of mint green, peach, and grey. As an event designer, I love to come up with concepts but often a great graphic designer takes my ideas to a whole new level! 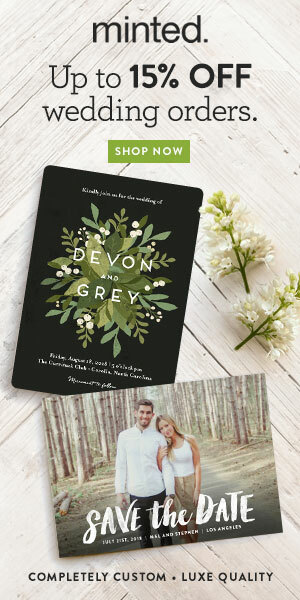 I sent Shayna from Steel Petal Press a photo of a concept for the main invitation, incorporating a geometric lace pattern, and she was able to turn my vision into beautiful reality with a design that incorporates blind debossed elements. We incorporated the geometric lace theme throughout the wedding, using it as a backdrop for our candy buffet and in other decorative elements. I had only ever come across one example of people turning the envelope vertically, and I fell in love. 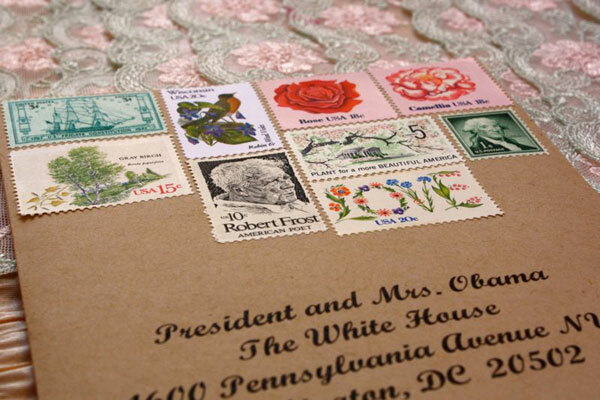 It was a perfect way to showcase the vintage stamps I had been collecting since getting engaged.